The important part of the IDEDOS is the virtual drive called "PCLink". It enables user to access PC storage peripherals directly from C64. The standard way. The PCLink drive gained standard features of normal IDEDOS drives. You just need to decide which hardware layer to use and run propper small server software called Ideservd. There exist server for Windows, Linux and OSX. The software support for the PCLink is implemented in the ROM (IDEDOS) of the IDE64 controller. While upgrading IDE64 firmware you have to choose propper IDE64 firmware. There are USB, parallel PC64, serial X1541, serial RS232 and Ethernet. USB PCLink came up with the IDE64 V4.1. 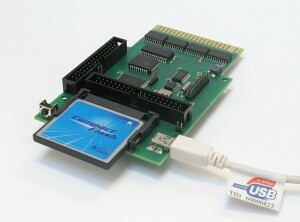 The FTDI USB 1.1 and 2.0 communication chip was added to the card. You need cable with 5 pin USB Mini B on one side and type A (standard USB) on second side. You only need to solder this cable and execute small server program on the PC. Warning: Incorrectly created cable can damage your PC and/or C64 computer. Never plug the cable while the computers are turned on. Use at your own risk. This option support regular Star Commander cables X1541, XM1541, XE1541, XA1541 for file transfers. Cable types are described in the Star Commander’s documentation, written by Joe Forster/STA. Supported RS-232 cards are DUART serial, SwiftLink serial, Turbo232 serial. To use serial RS-232 link you need DUART serial card and serial (null modem with handshaking) cable and execute small server program on the PC. Supported network cards are ETH64, (E)TFE or RR-Net card. Communication is done using UDP packets. Use an ethernet crosslink cable between the host computer’s network card and the ETH64, (E)TFE or RR-Net card. Or plug the C64 onto your local network.